When a developer says something like that, you know you are on to a gem. It’s even clearer when he says it while taking a brief break from dismembering demons with a combination of a katana and several large guns, all with a character that goes by the name of Lo Wang. Shadow Warrior is most definitely a gem. In all honesty, I wasn’t expecting much from Shadow Warrior. It was a remake of some ’90s FPS that I’d never heard of, by a studio that I had never heard of, so the signs weren’t all that promising. Clearly I am an idiot, because I walked away from my appointment thoroughly converted to Lo Wang’s particular brand of ultra-violence. In many ways, Shadow Warrior is about a sword. The story begins with Lo Wang negotiating a deal for an antique katana and, as the deal goes horribly wrong, Lo Wang finds himself in the midst of a demonic invasion. In order to survive, he strikes a deal with a demon who is slightly friendlier than the rest, and who grants him supernatural abilities that help him survive the onslaught. From that point on it is a smorgasbord of evisceration, decapitation and turning things into lumps of flesh. The developers swore blind that the game was actually quite story heavy, but the chunk that I got my hands on was literally just half an hour of killing things in increasingly-exciting ways. For the most part, I wielded the katana that I mentioned earlier, because I love nothing more than playing FPS games with a sword. It was good for me that I did, because the katana is one of the more powerful weapons in the game by the time it is fully upgraded, slicing and dicing most enemies with a great deal of ease (and gore). 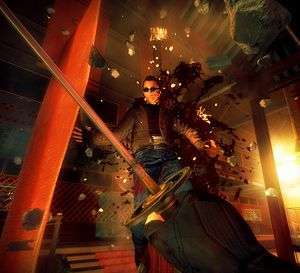 It was designed to be something more than a close-combat weapon that the player discards as soon as he gets a gun, and as Lo Wang continues to develop as a character, so do his sword skills. I was playing with a fully-upgraded character and, literally, took enemies to pieces almost at will. Some of his more powerful moves are carried out through double-taps of directional keys, along the lines of some fighting games, and although it was bizarre at first, it quickly became second nature, especially when trying to maintain some sort of crowd control. Although the katana was my weapon of choice, it was certainly not the only way to get things done. There is a decent selection of firearms that range from a powerful, almost shotgun-like, pistol to a crossbow that fires explosive bolts which can be detonated at will. Lo Wang can also pull off some rather impressive feats of dexterity, such as dual wielding sub-machine guns to better gun down those poor demons. Once in a while Lo Wang even picks up some truly unique bits of weaponry. The two of these (there may be more) that were shown was a demon’s decapitated head that fired a laser beam which set fire to almost everything that it touched, and a demon’s heart that Lo Wang crushed in his fist to stop the heart of a distant enemy. Watching it drop from a distance was cool, but does pale in comparison to the more gruesome damage you can inflict from up close. What’s more, the better you are at dismembering your enemies, the more experience you get. There is a star rating in the game, and the number of stars that you get corroborates with the amount of experience that you receive. It’s a nice little system that leaves you both proud of how well you tore those foes to pieces, and more capable of doing it again to the next bunch. Everyone wins. However, in order to gun them down effectively, you are going to have to get re-accustomed to a style of gameplay that has gone a little out of fashion. There is almost no cover to be found; instead the game forces you to get out into the open and move. 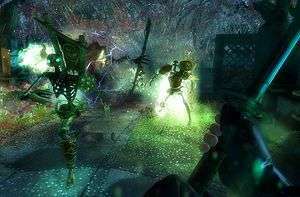 Everything moves faster than you’re perhaps used to and those twitch reflexes that you honed with games like TimeSplitters are going to get a real work out. In line with those sensibilities, there is no automatic healing. Find a health pack, or use a spell, but your health isn’t coming back on its own. You’ll also quickly learn to use powers that Lo Wang’s demonic deal has imbued him with because, despite the fact that they never actually kill anything, their crowd control aspects make it a damn sight simpler to kill them yourself. On the surface they seem almost totally over-powered, as there is no cool down, no mana system, and you can literally use them to your heart’s desire. There is a drawback to doing so, however, as overuse of your powers enrages nearby demons and causes them to grow in speed, power, and overall deadliness. They look even cooler when enraged however, so there is that. There’s only one other scenario when they become enraged, so you should check it when you can, but you will likely be too busy trying not to get killed by the large boss creature that did the enraging. There are a variety of boss demons that are bigger, faster, and stronger than the cannon fodder that Lo Wang spends most of his time mowing down, and many of them have unique powers. Some of them enrage said cannon fodder, while others return from the dead (or so I’m told). It will be no mean feat bringing them down, however, and doing so leaves you feeling flushed with victory, while still busy mopping up whatever smaller units are left after the big beastie’s demise. 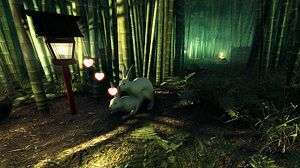 All this over-the-top violence is well and good, but perhaps my favourite thing about Shadow Warrior is the setting. Although it does take place during an apocalypse (of sorts), it spurns the dreary browns and greys of most of its modern contemporaries, instead opting for a more colourful palette, even if most of those colours are shades of red. Thankfully, colours that aren’t shades of red are also present, illuminating a gorgeous oriental world for Lo Wang to rampage through. Every part of the world looks good, and while some areas appear a little bland, that’s only because you can compare them to the other, more vivid, places you’ve visited throughout the game. There are some standouts, such as the bamboo forest that is calm and peaceful right up until the moment demons attack, and the bridges that span a river that Lo Wang is traversing. They may be gorgeous, but even the more bland areas do a more than adequate job of providing a good-looking backdrop for Lo Wang’s massacres. By this point it should be fairly clear that Shadow Warrior is not a sophisticated game. There are no deep moral decisions that will leave you pondering your choice for hours, and no consequences for your actions, at least from what I’ve seen. That doesn’t mean it’s not brilliant, however, because my few minutes playing it have left me inordinately excited to play it further. The slightly old-school focus for the gameplay is a breath of fresh air, while the katana work is both satisfying and unlikely to get old anytime soon. 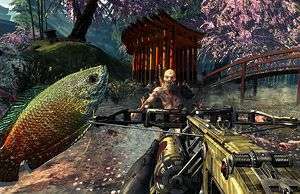 Playing with other weaponry is also a great deal of fun, lending themselves perfectly to the run-and-gun style that Shadow Warrior is aiming for. Plus, Lo Wang can dual wield SMGs. What’s not to like? The only thing that I’m worried about at the moment is the story. Despite numerous assurances that the final product will be story driven, there was little evidence to support that idea. It’s worrying, because Shadow Warrior does not deserve to be relegated to ignominy for the crime of a poor story, as it’s simply so much fun. I truly hope that Flying Wild Hog can produce on the story front, because if they do then Shadow Warrior will be truly and utterly brilliant. If they don’t, however, I don’t think that sense of fun will hold up. Despite that nagging worry, I’m hugely excited about this game. Having entered my appointment with fairly low expectations, I was completely blown away by the product they showed me. Flying Wild Hog have done a stellar job in not only bringing this ’90s FPS to the modern age, but also ensuring that it will be even better than before when they are done with it. I can’t wait. What's a Blood Sport Without Personality?